Want to give someone an ethical present? Give them a gift that aligns with positive environmental values! You can visit the City Farm Nursery for living gifts and a range of books, seeds and gardener’s needs. 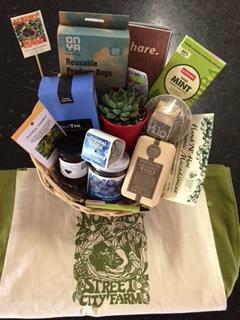 Or make up a gift basket of produce and goodies from the makers and growers at the Organic Farmer’s Markets. If you can’t make it to the Farm, consider giving one of the gifts below. Northey Street City Farm Hampers are lovingly created from ethical products sourced from our Sunday Organic Farmers Market Stall Holders. Once you place an order we get in touch to create a hamper that suits your needs. Hamper products range from beeswax candles, essential oils, soaps, facial products, teas, plants, keeper bags, organic olive oil, jams and preserves, macadamia nuts, honey, organic dark chocolate, organic biscuits, kombucha, organic muesli, vouchers from a range of stalls like a homemade organic pie from the Organic Happy Kitchen, a gift voucher from Miessence, Kombucha, Water Kefir or Brew Kits from Buchi Brew Co., Sparkling Mineral Water from Mineral Water Direct, vouchers for Green Smoothies, a pirates dice game from A-Zumble-Zay, and so much on offer from our stall holders! We can make up hampers along the lines of being eco friendly with keeper bags, health and beauty with a range of ethical body products, or hampers for the foodies! All delivered in a rustic basket or a Northey Street Tote Bag! Hampers are offered in the $50, $100, $150 and $200 price range. Order now and we will tailor a hamper for your needs! The City Farm Nursery has a huge product range. A host of plants for sale, from herbs to fruit trees. A large range of gardening products from seeds, soils, mulch, and organic fertilizers. 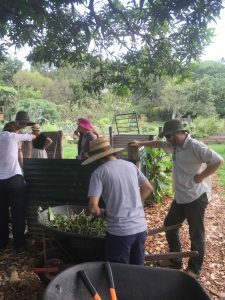 There’s also honey, books, home wares, vertical gardens, vege pods, and so much more! A nursery gift voucher is a gift for anyone! 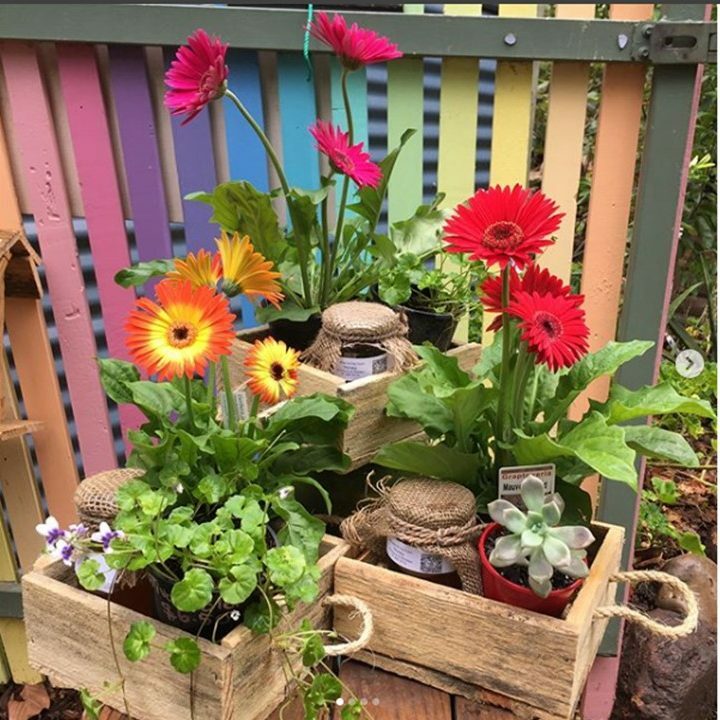 City Farm Nursery Gift Vouchers are offered as a $25, $50 or $100 gift voucher. 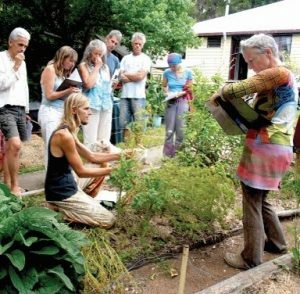 The Northey Street City farm Permaculture Cookbook is now on sale for only $10! 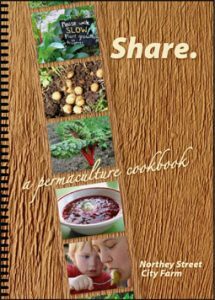 Share is simply the best, most heartfelt, interesting and useful cookbook you may ever own. Written completely from the heart with sharing in mind! Share retails for $10 plus $3 per copy postage and handling. Simply email: info@nscf.org.au to order a copy. Copies are also available at the City Farm Nursery to save postage costs. Or buy one here and we will post out a copy. 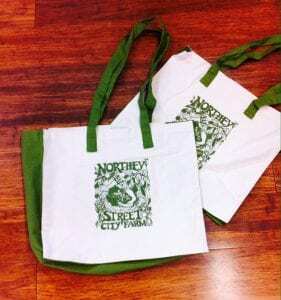 The Northey Street City farm Tote Bag is only $15! Our canvas tote bags are made from organic cotton perfect for heading to the Markets, loading up with fresh fruit and veggies or just as handy as a beach bag. It has a small inside pocket for keys and phones, sturdy green straps and expandable side panels. Tote Bags retail for $15 plus $7 per order postage and handling. 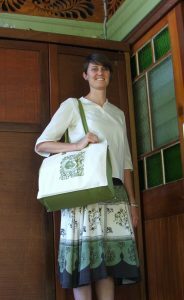 Simply email: info@nscf.org.au to order a bag, or they are also available at the City Farm Nursery to save postage costs. Or buy a bag online here through Paypal. Give the gift of knowledge.